If you're one of the thousands of people who have signed up to volunteer in the Gulf Coast, don't pack your bags just yet — and don't think you'll actually see the oil. 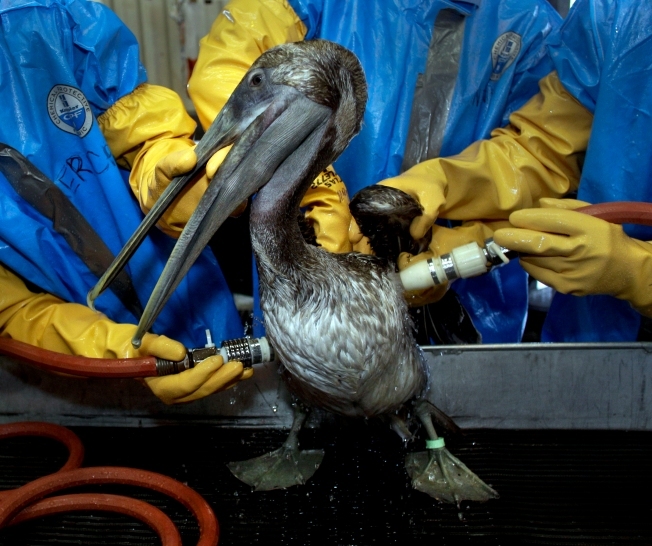 The massive oil spill in the Gulf of Mexico and countless images showing slicked coastlines and pelicans in detergent baths have prompted thousands of volunteers to make plans to help with relief efforts. Some of them are planning service vacations. “We receive 25-30 inquiries a day,” said Janet Pace, Executive Director of the Louisiana Serve Commission. The oil washing up on beaches is hazardous, so government agencies and environmental organizations have joined BP, the oil company that has taken responsibility for the oil spill and is footing the bill for clean-up, in ensuring only those with proper training, supervision and protective gear will work in the contaminated areas. BP is working with the unemployment agencies of Gulf Coast states, training citizens who have lost their livelihoods and paying them as Qualified Community Responders. Primarily, QCRs are tasked with cleaning shorelines contaminated by oil. Pace and other directors of Gulf state volunteer agencies meet weekly to discuss, among other things, how to involve out-of-town volunteers in local clean-up efforts. And wildlife conservation groups are creating databases filled with the names of tens of thousands of volunteers from throughout the country — and world — who want to help. It’s a similar story in Mississippi. Many of the 4,000 registered volunteers have participated in Coast Watch efforts to identify wildlife and habitat affected by oil, and in organized efforts to remove man-made debris from beaches, said Emily Wilemon of the Mississippi Commission for Volunteer Services. “Once oiled wildlife is cleaned, volunteers will be able to help in the rehab process by cleaning and building cages, by watching over the birds and by providing support activities to the trained workers cleaning oil from the beaches,” she said. Volunteers have been put to work removing debris from beaches, Spencer said, so they will be easier to clean when oil makes landfall. The state is urging visitors to join the Coast Watch program, and potential volunteers are being asked to register with organizations in communities they plan to visit. Furthermore, before leaving home, volunteers are urged to get training as a member of a Community Emergency Response Team (CERT), a non-emergency 211 operator who can connect callers with community services, or a volunteer manager before leaving home. For general inquiries, a good step is a call to BP’s Deepwater Horizon Response Volunteer Request line — 866-448-5816 — to register your availability and skills. Be ready to answer a few questions. An operator will take your contact information (name, home town, zip code and e-mail address) and ask if you have any specialty skills. “We’re training emergency responders on what to do to be ready in the event oil hits the beaches in their area,” said Ray Viator, spokesman for BP Deepwater Horizon Response. Whether you’re a wildlife professional, state or local government official, firefighter, police officer, paramedic, physician or nurse, be sure to share that information when you call. General volunteers may be put to work pre-cleaning beaches and helping with administrative functions, record keeping and other support services. The Deepwater Horizon Response Center does not coordinate volunteers, but forwards information it gathers on to the appropriate state agencies. Local, regional and national conservation and environmental organizations are also being inundated with offers of help. While these groups anticipate that volunteers will soon be needed for everything from shoreline clean-up to Web site management, groups are currently asking that volunteers simply register their interest. “We will contact registered volunteers when an appropriate opportunity is available for you to assist,” reads a message on LA Gulf Response, a consortium Web site made up of the Nature Conservancy, the National Wildlife Federation, The Audubon Society, the Coalition to Restore Coastal Louisiana, and the Barataria-Terrebonne National Estuary Program. That gives you time to mark your calendar, register with a volunteer agency and get trained locally before you head for the Gulf. Harriet Baskas is a frequent contributor to msnbc.com, authors the “Stuck at the Airport” blog and is a columnist for USATODAY.com.You can follow her on Twitter.